Lyme disease is caused by a germ. You can't catch Lyme disease from a person - you catch it from a tick bite. It is spread by the bite of a deer tick. A Tick must usually be attached to the body for at least 24 hours before they pass the Lyme disease germ to people. Not every tick bite causes Lyme disease. Symptoms can appear 3 to 32 days after a tick bite. as a small, red, round area, which can spread to two or more inches across. The center of the rash may clear giving a "bull's eye" appearance. Other symptoms can be fever, headache, feeling tired, stiff neck, joint pain and swollen lymph nodes. Without treatment, the heart, nervous system, or joints may be affected weeks to months later. People may be exposed when they spend time outdoors in tick - infested areas. Ticks like a moist, shaded area such as wooded, or grassy places. A person can also get Lyme disease from a tick that has been brought into the house by a pet or small rodents (like the white footed mouse). A person can get Lyme disease more than once. You can get a blood test. A blood test for Lyme disease can be done. In the early stage of illness the test may be negative. Diagnosis of Lyme disease in the early stage is usually based on symptoms of Lyme disease in a person with a known tick bite. Lyme Disease can be treated; see your doctor if you think you have Lyme disease. Early treatment is needed to prevent serious and sometimes prolonged illness. Avoiding tick bites is a way to prevent Lyme disease. Avoid tall grass and areas where you know ticks are present. 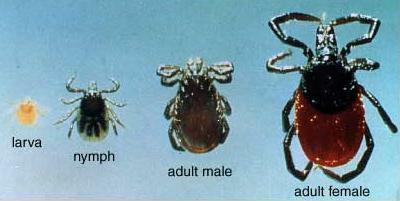 Ticks are most common in the summer and spring. Inspect children and self for ticks while you are in tick infested areas and after a visit to tick infested area. Look along the hairline, in the hair and ears. Check under the arms and in the groin area as well. Dress to keeps the ticks off your skin. Wear long pants and long sleeved shirts. Wear wide brimmed hats. Since ticks crawl upward, tuck socks and shirt into pants. Keep shirt sleeves and collar buttoned. Wear light colored clothes to help spot ticks. Use bug spray (containing not less than 30% Deet). Apply to clothing where it overlaps or has an opening. Apply across the shoulders, down the outside of arms and around the brim of your hat. Read the directions on the bug spray bottle carefully. Do not spray near your eyes. Make sure it is safe to use on children. Remove the tick with a tweezers. untill it comes away from the skin. Do not squeeze or smash the tick! Do not use a lit match, petroleum jelly, nail polish, or other chemicals to remove the tick. Record the date of the tick bite on the calendar. Look for signs of early Lyme disease for the next 32 days such as a rash at the site of the bite/or a mild flu - like illness. A vaccine can prevent Lyme disease. There is one Lyme disease vaccine in the United States. It is used for people ages 15 to 70 years old. The Lyme disease vaccination series consists of three shots. areas, or grassy areas where they live, play and hike. The vaccine does not always prevent Lyme disease and may not be right for you. Talk to your doctor for further information about the Lyme vaccine.